Climate change control has risen to the top of the international agenda. Failed efforts, centred in the United Nations, to allocate responsibility have resulted in a challenge now reaching crisis stage. John J. Kirton and Ella Kokotsis analyse the generation and effectiveness of four decades of intergovernmental regimes for controlling global climate change. 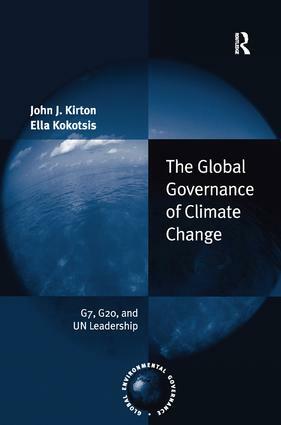 Informed by international relations theories and critical of the prevailing UN approach, Kirton and Kokotsis trace the global governance of climate change from its 1970s origins to the present and demonstrate the effectiveness of the plurilateral summit alternative grounded in the G7/8 and the G20. Topics covered include: - G7/8 and UN competition and convergence on governing climate change - Kyoto obligations and the post-Kyoto regime - The role of the G7/8 and G20 in generating a regime beyond Kyoto - Projections of and prescriptions for an effective global climate change control regime for the twenty-first century. This topical book synthesizes a rich array of empirical data, including new interview and documentary material about G7/8 and G20 governance of climate change, and makes a valuable contribution to understanding the dynamics of governing climate change. It will appeal to scholars, researchers, and policy makers interested in the dynamics behind governance processes within the intergovernmental realm. John J. Kirton is a professor of political science and the director and founder of the G8 Research Group, co-director and founder of the G20 Research Group, as well as the co-director of the BRICS Research Group and the Global Health Development Program, at the Munk School of Global Affairs at Trinity College in the University of Toronto. He is author of G20 Governance for a Globalized World. Ella Kokotsis, PhD, is the Director of Accountability for the G8 and G20 Research Groups at the Munk School of Global Affairs at Trinity College in the University of Toronto. Ella has contributed to many volumes in Ashgate's Global Finance series.